When Jurassic Park first opened it was an event. This was at a time when computer generated effects were still cutting edge, and the creation of dinosaurs for film was something spectacular. Now the use of CGI is so commonplace that these achievements appear ordinary, but at the time it was breathtaking to witness. And these films still look spectacular, especially in high definition Blu-ray. 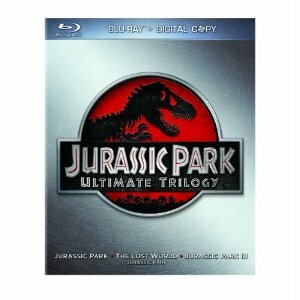 This package comes with all three films in the Jurassic Park trilogy on Blu-ray, as well as digital copies of each movie. All three films are also presented on the Blu-ray discs in perfect high definition picture and 7.1 audio for the spectacle of the soundtrack. Steven Spielberg created a memorable franchise with the original adaptation of the Michael Crichton fantasy thriller, and even returned to direct the sequel, The Lost World. Combining science with science fiction, Jurassic Park is about an island with genetically created dinosaurs roaming around. A wealthy genius has the goal of turning this island into a giant theme park where people come to see the giants from the past, but these creatures can’t be contained and the theme park turns into a nightmare of survival. The two sequels which follow are simply about the aftermath of these creations, including additional survival stories when faced with these prehistoric beasts. As well as the two Steven Spielberg films and the second sequel directed by Joe Johnston, the Jurassic Park trilogy on Blu-ray also comes with over two hours of exclusive new special features, including a 6-part retrospective making of documentary. Also included are all of the archival featurettes from past DVD releases and the previously mentioned digital copies.